Definition at line 60 of file RTDyldMemoryManager.h. Definition at line 145 of file RTDyldMemoryManager.h. 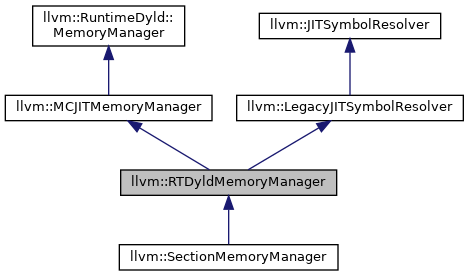 Definition at line 32 of file RTDyldMemoryManager.cpp. Definition at line 142 of file RTDyldMemoryManager.cpp. Deregister EH frames in the current proces. Definition at line 129 of file RTDyldMemoryManager.cpp. It is used to resolve symbols during module linking. By default this falls back on the legacy lookup method: 'getSymbolAddress'. The address returned by getSymbolAddress is treated as a strong, exported symbol, consistent with historical treatment by RuntimeDyld. Clients writing custom RTDyldMemoryManagers are encouraged to override this method and return a SymbolInfo with the flags set correctly. This is necessary for RuntimeDyld to correctly handle weak and non-exported symbols. Definition at line 100 of file RTDyldMemoryManager.h. By default this falls back on the legacy lookup method: 'getSymbolAddressInLogicalDylib'. The address returned by getSymbolAddressInLogicalDylib is treated as a strong, exported symbol, consistent with historical treatment by RuntimeDyld. Definition at line 123 of file RTDyldMemoryManager.h. This method returns the address of the specified function. If AbortOnFailure is false and no function with the given name is found, this function returns a null pointer. Otherwise, it prints a message to stderr and aborts. This function is deprecated for memory managers to be used with MCJIT or RuntimeDyld. Use getSymbolAddress instead. Definition at line 289 of file RTDyldMemoryManager.cpp. This method returns the address of the specified function or variable. It is used to resolve symbols during module linking. Definition at line 85 of file RTDyldMemoryManager.h. Definition at line 108 of file RTDyldMemoryManager.h. This method returns the address of the specified function or variable in the current process. Definition at line 228 of file RTDyldMemoryManager.cpp. Definition at line 136 of file RTDyldMemoryManager.cpp. Register EH frames in the current process. Definition at line 119 of file RTDyldMemoryManager.cpp. Referenced by llvm::__deregister_frame(), and registerEHFrames(). Definition at line 146 of file RTDyldMemoryManager.h. Referenced by deregisterEHFrames(), and registerEHFrames().